"Imagination will take you everywhere," said Albert Einstein, and he was right. As humans, we're limited in what we know and understand, but imagination transcends all of that. Unfortunately, we tend to bolster our fantasies by buying the props that go with them. Francine Jay, author of The Joy of Less and Lightly, calls this "aspirational stuff." These are the things we buy to project a certain image, to impress others, or to help ourselves believe we're a certain type of person. I once imagined I was a great home cook, so I decided I needed a shelf full of celebrity cookbooks and drawers full of specialty gadgets. With a little more imagination I might have decided I needed a professional six burner stove and a Sub-Zero refrigerator too. In reality, I don't enjoy multi-step cooking day after day. I fix crock pot and one skillet meals, I use certain recipes often, and I've decided I don't have to impress anyone. I have a binder that holds all my recipes, I find new recipes online, and I need only basic utensils. I sing opera, so I used to imagine I needed a closet full of formal gowns. The reality is that I sing opera, but the director puts me in a costume and a wig. I need only one elegant black gown to be appropriately dressed for the occasional solo or recital gig. Sparkly earrings or a silk wrap of any color can be added for variety. It took me a while to notice that my fantasies tended to require a lot of stuff while the reality could be satisfied by a minimalist approach. Did I buy all that stuff just to bolster my sense of self worth? Or to combat boredom? Does it really take courage to admit that I don't own a citrus zester or a full set of Le Creuset cookware? Is it my gown that people come to see, or is it my voice they come to hear? It's not that hard to decide I want to be known for my voice! I'm not going to perform a Mozart aria in jeans and a tee shirt, but elegance and professionalism don't require a closet full of one-time-use formals. And if my voice isn't top-notch, the extensive wardrobe won't fool anyone. It's what I do, not what I have, that really matters. A friend of mine uses one pattern over and over, purchases different fabrics as needed, and has given away dozens of well-loved heirloom baby quilts. Another keeps adding to a large, expensive, and hard-to-store fabric stash, but hasn't finished a quilting project in several years. Recognize that you are not the same person you were ten years ago. Your interests, tastes, and life circumstances have changed. Maybe it's time for you to declutter your attachment to the title "Quilter" because that's no longer who you are. Make a decision to keep only those things that support who you are today. 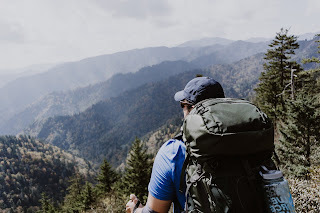 Do you own top-of-the-line backpacking gear you haven't used in a while? Maybe you're nearing 60, and you have a bad knee, so the most you can handle is a not-too-strenuous day hike, but you hang on to all the paraphernalia because you once planned to traverse the entire Muir Trail. Why don't you keep that photo of yourself looking fit and handsome on a long-ago hike in Yosemite, but donate or sell the equipment? Then start imagining the challenge you might like to try now. Fantasies are fun, and they can be useful for identifying what you care about and where your interests lie. But beware of trying to purchase the fantasy. Invest your limited time, energy, and money actually doing what you like rather than buying stuff, since things will never make you something you are not. High-end clubs won't make you a championship golfer, only years of hard work and practice will do that. Designer shoes won't make you a supermodel; it takes genes, confidence, hard work, and luck. A new vacation home won't guarantee quality time and happy family memories. You need to actually spend the time playing with, talking to, and listening to your kids. And you can do that anywhere. Stop shopping so you can spend more time learning, creating, and enjoying the people and the beauty around you. Please share in the comments if you're finally ready to declutter the props for someone you used to be or once thought you'd like to be.